Byron Bay is one of our favourite places on the planet, so it made perfect sense to us that we’d kick off our new blog series ‘Daily Rituals’ by taking a glimpse into the Byron hinterland haven of Julia Ashwood (AKA Julz), founder of digital travel & lifestyle platform, The Vista; a destination in itself for the modern traveller, by a modern mama. 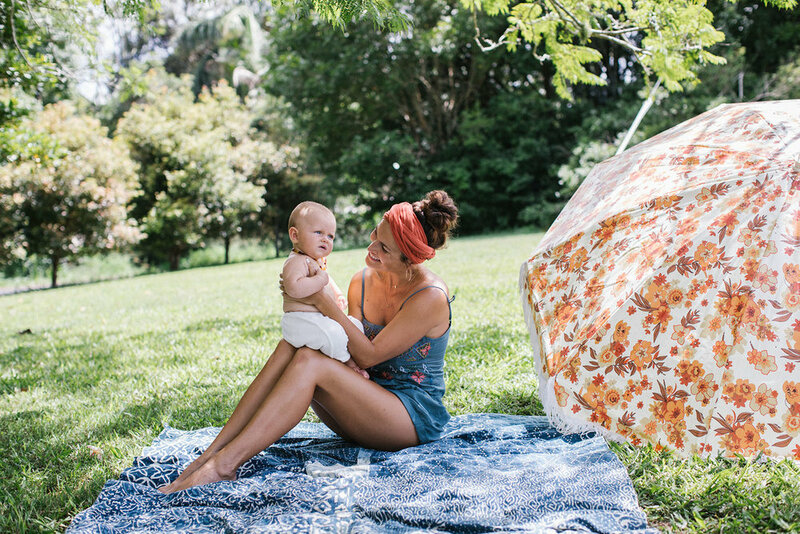 Julz, her husband Matt and their adorable bub Delilah Bee (Dee Dee), recently relocated north from Sydney to their new home on a macadamia nut plantation, sitting pretty above the Byron Bay coastline. Fresh, airy, surrounded by greenery, it’s a space where you feel instantly grounded and connected to nature. We spent the day with Julz to uncover her daily rituals and how she maintains that glowing complexion…even as a new mama! Like most working mums, Julz understands the challenge of finding time for herself throughout her busy day. So it goes without saying that finding the quietest moment begins first thing in the morning before Dee Dee is awake (sometimes!) and her day is in full swing. To begin her morning routine, Julz starts with a shower and a hot cup of coffee, before juggling the roles and responsibilities of The Vista with motherhood; equally her passions. Meetings are balanced with nap times. When Julz returns she loves nothing more than to change into something more casual and feed Dee Dee in their favourite spot on the verandah. Quality time in all things is high on Julz’s priority list. Soaking up some Vitamin D (which was in abundance on the day we visited) with Dee Dee during a walk or an outdoor picnic amongst the beauty of their natural surroundings makes for the perfect hang time. Eating organic and nutritious food is a priority to Julz to feed her family, body and soul. As well as cultivating seasonal produce in her own veggie garden, market day at the local farmer’s market is a must. As the day winds down baby baths and massage also factor into quality time and for these moments Julz loves to use Calm it Baby baby oil. Natural ingredients and calming essential oils create a blissed out state of being for both mama and bub; always a highlight of their day. Sunsets – with wine! – on the deck are a great way to connect as a family and most importantly, to relax, unwind and reflect at the end of the day.